Want to put the power of reinvested dividends to work for your portfolio? Take a look at 3M, Genuine Parts, and Waste Management. 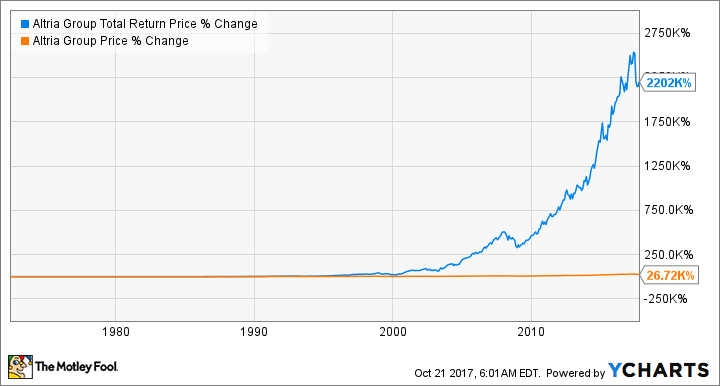 If you want to be blown away by the wealth-building power of stocks that pay ever-growing dividends for decades, look at this chart for Altria Group (NYSE:MO). The orange line represents just stock price appreciation, while the blue line represents the total return if you were to reinvest every dividend check you made. While a 26,000% price gain is awesome in its own right, reinvesting dividends over 40 years with this stock would result in a 2.2 million percent return! If that doesn't inspire you to buy dividend stocks and hold them for decades at a time, I don't know what will. This kind of investing works only when you can find the kind of stocks that are able to grow their dividends year in and year out for a lifetime. Selling cigarettes, as Altria does, is a business that can do that, but it isn't the only one. So we asked our Foolish investors to each highlight a stock they see as one that could be a lifelong dividend payer that you might want to consider for your portfolio. Here's why they picked 3M (NYSE:MMM), Genuine Parts (NYSE:GPC), and Waste Management (NYSE:WM). Travis Hoium (3M): There's no guarantee any company will pay a dividend for the rest of your life, but companies that have a good chance are diverse and adaptive, with strong cash flows. 3M fits that description and on top of that has a 100-year history of paying dividends to investors. 3M's business is arguably the most diverse on the market, touching everything from energy to consumer staples to the highest tech smartphones in the world. That means the company isn't reliant on cash flow or growth in any single industry to keep its dividend going. 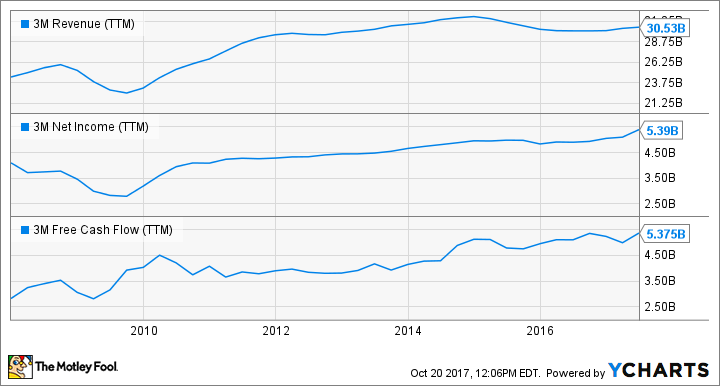 This dynamic has led to steadily growing earnings and free cash flow for most of the past decade. I don't think 3M is going to be a big growth stock and probably won't raise its dividend a lot in the next few decades, because it isn't in the high-growth segment of the economy (tech). But that doesn't mean 3M won't continue to spit off cash from products such as Post-it Notes, Scotchgard, and sandpaper, among hundreds of other products it makes that we use every day. Diversity is 3M's strength, and that's why this is a dividend I would bet on getting for the rest of your life. Rich Duprey (Genuine Parts): Perhaps best known for its NAPA retail stores, Genuine Parts is a leading distributor of aftermarket auto parts. It remains the sole member of the National Automotive Parts Association, a voluntary trade association formed in 1925 to provide nationwide distribution of auto parts. The do-it-yourself market tends to be resilient in all kinds of economic conditions, but it tends to shine when times get hard as car owners try to make their vehicles last as long as possible and work on them to keep them going. As a result, Genuine Parts has enjoyed sales growth in 84 of its 89-year operating history, while profits have also grown in 73 of those years, too. Genuine Parts went public in 1948 and immediately began paying dividends, meaning it's been making uninterrupted payouts to investors for 69 consecutive years. Equally impressive, the auto-parts retailer has increased its annual dividend for 61 straight years, qualifying it to be a member of that rarefied group of companies known as Dividend Kings that have raised payouts for 50 years or more. Tyler Crowe (Waste Management): Waste Management hasn't quite made its way on to the Dividend aristocrat list -- its current streak of dividend increases is 14 years -- but the company's mile-wide economic moat, management's ability to turn trash into treasure, and its relatively strong margin of safety on its current payout all suggest the company should be able to keep its dividend going for a long time. The waste hauling and handling business is built for large players to dominate. First, it's nearly impossible for new entrants to get into this business. Even if a company could come up with the hundreds of millions of dollars to build a landfill and an adequately sized collection fleet, it would still have to deal with the nightmares of permitting and zoning that comes with landfills and the not-in-my-backyard stance that rises up against them. Thus, companies with economies of scale and already established landfills are going to monopolize a certain geographic region, which makes it relatively easy to raise prices when the company needs to. Trash collection isn't a high-margin business. Waste Management's gross margin is in the mid-20% range, which isn't huge. However, management has been superb at finding innovative ways to cut costs or generate revenue from places you might not think of, such as selling methane gas produced at landfills as fuel. It's initiatives like this that turn costs into additional revenue that show how the company has been able to maintain better than 10% returns on equity for more than a decade. Waste Management has a payout ratio hovering in the 50% range. With free cash flow also more than double its current dividend commitments, there's plenty of room to grow that payout over time. Unless we somehow stop producing waste, then Waste Management looks like a stock that could be paying you dividends for as long as you hold it.